The proceedings of the 2012 CPAS conference are now available! Edited by Chris Calvert and Jessica Gröling, this collection includes papers by Richard Ryder, Kim Stallwood, Jane Flynn, Seán McCorry, Gill Bliss, Daniel van Strien, Alexander Badman-King, Sarah Crowley, Nathan Stephens Griffin and the editors. Its subject matter ranges from the history and strategy of the animal rights movement to horses, George Orwell and anthropomorphic characters; from animal experimentation to the badger cull. Look carefully and you might even find a comic. The document has been typeset and presented very much with printing in mind. While we looked into the options for making a printed version available, we soon realised that for the readership we anticipate it would be far easier and cheaper for readers to print their own copies if they wish to do so. We hope you will find these proceedings interesting and thought-provoking, and we encourage everyone to link to them, cite them in your future work and circulate copies to interested potential readers. Many thanks to all who contributed. We recorded all of the panels at the conference. The videos are now available on the video page. Please share widely! We are also currently in discussion with speakers and workshop leaders about putting together a conference proceedings publication, hopefully by autumn this year. We have also created a page of courses and academics willing to supervise PhD theses on human-animal relations, Critical Animal Studies, anthrozoology etc. Please e-mail us if you would like to add your name or course to the list. The page currently also has information about a PhD studentship being offered by the University of Leicester in conjunction with the Centre for Animals and Social Justice (deadline 28th May 2012). Have a look if you are interested! Finally, please take a look at this great write-up of the conference by one of our delegates. If you are on our mailing list we will keep you informed of any future events that we organise. If you would like to post a link for one of your events on our Links and Future Events page then simply send us an e-mail. The conference is now just one week away! We are looking forward to what promises to be an exciting and informative day, filled to the brim with presentations, workshops, films, stalls, and more. Take a look at the latest version of the programme for more information. Please let us know no later than 72 hours before the conference if you are no longer able to attend. We have worked hard to keep this event free for everyone to attend, but university catering is expensive and we don’t want to order more tea & coffee than is needed. Please remember that our venue is the Queen’s Building on Exeter University campus. More details on how to get there, bus times, where to park if you are coming by car etc., can be found on our conference information page. Registration is from 8.30 – 9am. Please arrive early to prevent any delays as the first presentations are scheduled to start shortly after 9am. If you are arriving in Exeter on Friday night, please join us for a drink and/or some food in the function room of the Imperial pub from 8pm. If you come to the pub, you will be able to pre-register and receive your conference pack, enabling you to skip the registration queues in the morning. Please remember that lunch must be pre-ordered on the morning of the conference. When you register in the morning (or the night before) you will be able to choose from a selection of vegan lunch meals. To ensure quick service, lunch will be served in three sittings. When you sign up for your meal, you will also be asked to specify whether you would like to have lunch at 1, 1.30, or 2pm. The evening meal at Herbies Restaurant in town (for those of you who have pre-booked) starts at 7.30pm. Please be there on time as we have the restaurant for an hour and the benefit gig in the NBI pub starts immediately afterwards. Even if you are not coming to Herbies, please do join us for an evening of live music and poetry at the NBI from 8.30 – 11. Donations on the door, in aid of South Devon and Cornwall Hunt Saboteurs. More information on our evening entertainment page. Update 27th February – Still a few places left so register asap! CONFERENCE VENUE: Queen’s Building, University of Exeter (Streatham Campus). Please see here for information on how to get to the venue. REFRESHMENTS AND LUNCH: Tea & coffee will be free. Lunch will have to be pre-ordered on the morning of the conference (so if you know you will be arriving late, please get in touch beforehand so we can order your lunch for you). Lunch will be in the Long Lounge in Devonshire House, with a selection of vegan meals between £3.50 – £5 (plus VAT for non-students). EVENING MEAL: We are now fully booked for the meal at Herbies. If you would like to be put on a reserve list in case somebody else drops out, let us know by e-mail. 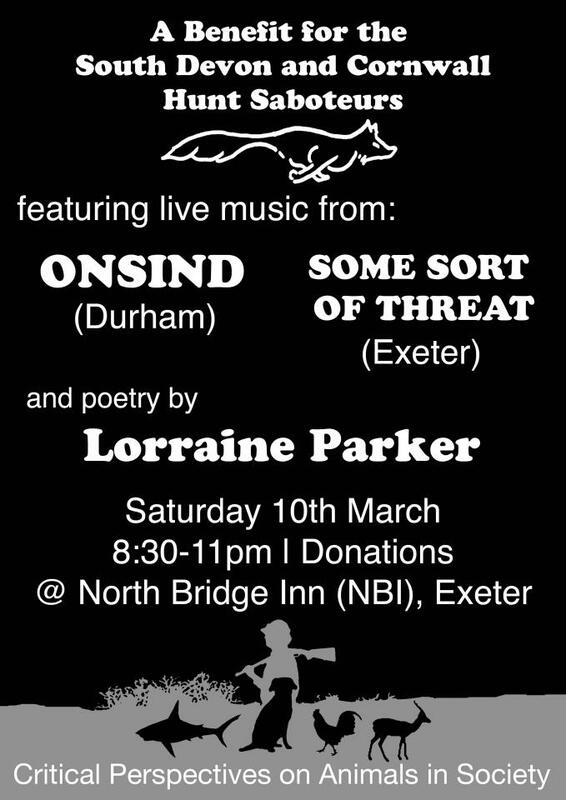 FUNDRAISING GIG: There will be a fundraising gig in the evening of the conference to raise money for the South Devon and Cornwall Hunt Saboteurs. Please see here for more details. This exciting event will bring together postgraduate students focussing on human-animal relations, critical animal studies and anthrozoology, as well as activists, campaigning organisations and interested members of the public. Everyone is welcome to attend. 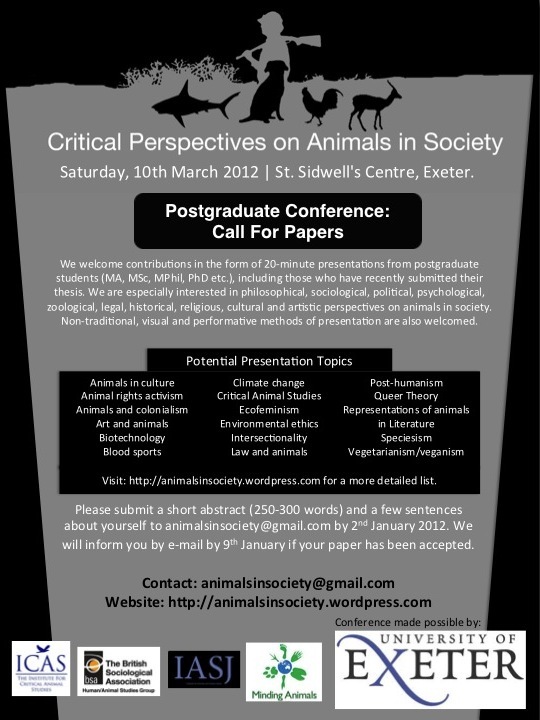 Conference details: This event will take place on Saturday 10th March 2012, 9am – late, at the St. Sidwell’s Centre in Exeter, UK. This conference is kindly sponsored by the University of Exeter and registration is FREE and open to everyone. To register, please click here. Please register by 3rd March 2012. This is an official Minding Animals 2 pre-conference event. Travel bursaries and accommodation: Please see our conference information page for more details. Catering: Lunch and refreshments will be provided at the venue by Herbies Restaurant. All catering at this event will be vegan. If you have any other dietary requirements or allergies, please notify us in advance. The food will be FREE for all registered conference participants. Any donations you wish to make will go to support some of the campaigning organisations involved in the conference. Academic participation: The call for papers is now *closed*. Thank you to all who have submitted abstracts for presentation. We have had submissions from eight different countries on a great variety of interesting topics. Candidates will be informed by Monday 9th January whether their paper has been accepted and a full conference programme will follow in mid-January. Aside from presentations, there will also be a number of workshops at the conference. Get in touch if you have an idea for a workshop you would like to run and we can discuss options with you. Non-academic participation: We would like this event to contribute to bridging the gap between academics and the wider community, including activists and animal advocacy groups. Anyone is welcome to attend the conference, listen to the presentations and join in the discussions and advocacy groups are invited to hold a stall on the day to promote their campaigns. This is a great opportunity for postgraduate academics to make contact with those working at the cutting edge of current animal issues and for activists to find out what postgraduates are currently researching and writing about (although we are aware that many conference participants may be ‘hybrids’ of the two anyway). If you have ever wondered whether research is being done that might be relevant to your campaigns or if you would like to network with academics and help set research priorities for the future, please come along and join in the discussions. If you or your group would like to hold a stall, please click here for more information. Update 16/12: PLEASE NOTE that we have very few spaces left for group stalls. To avoid disappointment, please get in touch asap if you would like to hold a stall for your campaign. Non-stall-holding groups are still very welcome to participate on the day and bring some promotional materials for display. Our call out for activists is available as pdf file. Please help us to spread the word by downloading and distributing it. Artists and Musicians: We also welcome participation from artists and musicians. If you would like to display and/or sell your artwork at the conference, get in touch and we can arrange to set up a display space for you and promote your artwork if you are unable to attend on the day. There will be a live music event on Saturday evening to raise money for a selection of national and local campaigns. If you or your band would like to perform, click here for more information. Conference programme: A detailed programme will follow in January 2012. There will be presentations from postgraduate students, workshops and discussions about the potentials and pitfalls of interdisciplinary and collaborative research with advocacy groups, tutorials on how to use research tools such as the Freedom of Information Act, campaigns stalls, art displays, free food and live music in the evening.